CARLSBAD — The election may be over, but the voting isn’t. 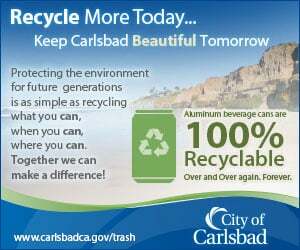 Six new trashcans, all different types, were installed in Carlsbad Village this week for a “beauty contest” to determine which one residents, business owners, and shoppers like the best. Each receptacle was named (Lois, Selena and Pamela are just a few examples) and has a placard telling pedestrians how to text in their vote.The trash receptacles are all located on State Street between Carlsbad Village Drive and Grand Avenue, with one by the fountain at State Street and Grand Avenue. Voting is open through Nov. 30. The cans were either donated or loaned by various street furniture manufacturers. The goal of the contest is to determine which cans the public likes best and which perform the best — and ultimately to upgrade the existing receptacles throughout the Village. The project was created as part of the revitalization effort that the city of Carlsbad initiated in April. Urban Place Consulting Group obtained the donated cans and the Parks and Recreation Department installed them. Village Works is a collaborative effort of the Carlsbad Village Association, Urban Place Consulting Group, and the city of Carlsbad. Its goal is to improve the village user experience, refine the urban environment, and realize the full potential of the Village to become the preeminent downtown of North County San Diego.